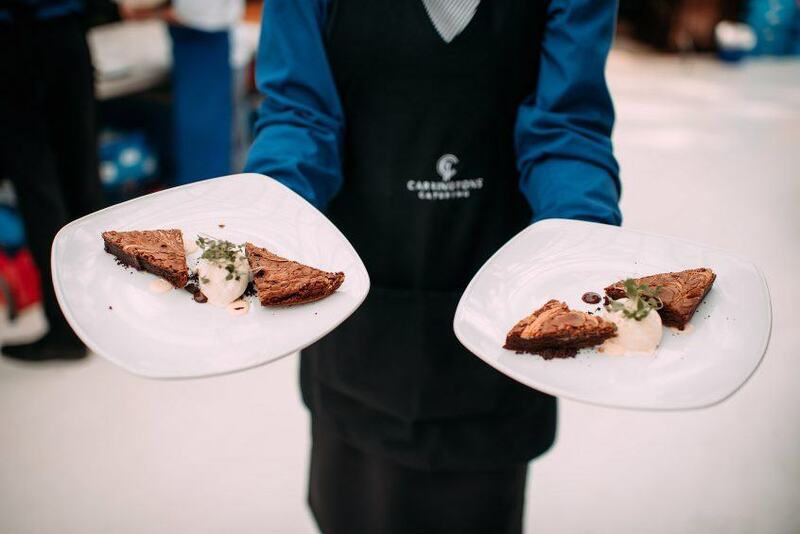 Here at Carringtons Catering, we love nothing more than being part of a couple’s big day. 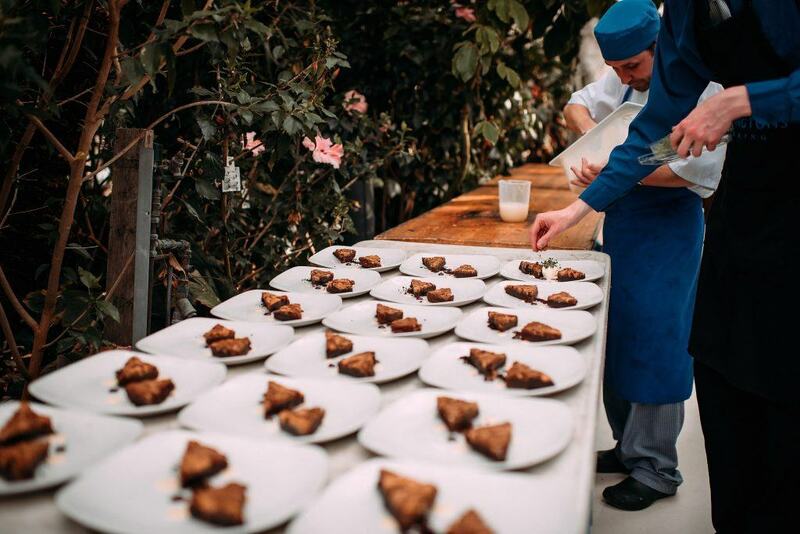 During our 40 years in business, we have catered for thousands of weddings all around the North West and it’s fair to say that no two days are the same! 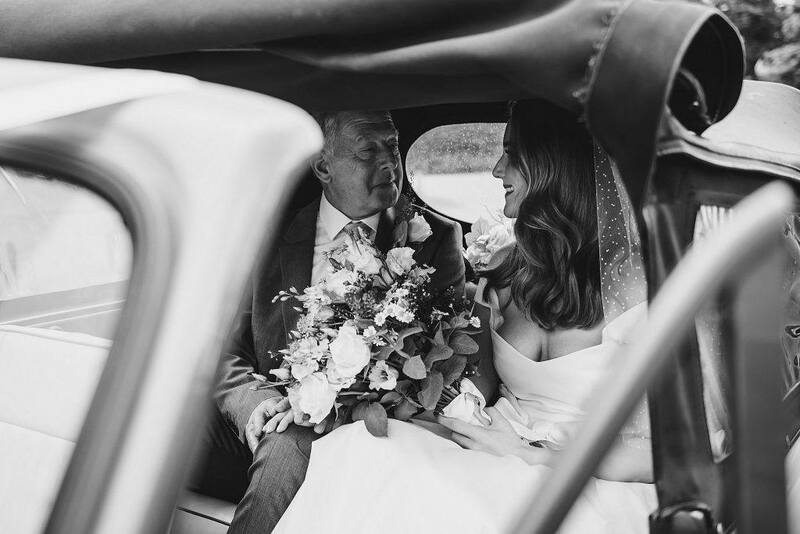 In a bid to share some of the fantastic weddings that we are involved in, we have decided to profile some of our favourites on our website and we’re certainly kicking off in style with what was a day to remember for Laura and David – and our team. 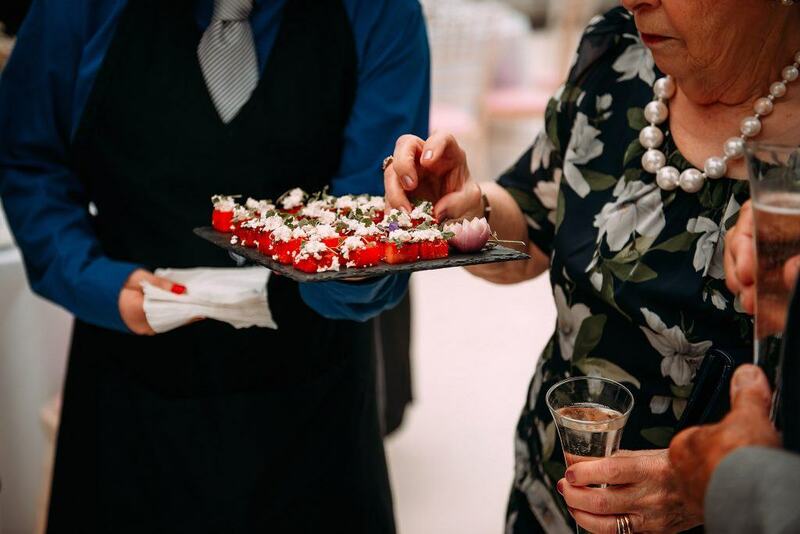 Keep your eyes peeled for our upcoming blog posts, where we will share with you some examples of the merriments that we have been honoured to contribute to – you may even find some inspiration for your own special day! After a seven-year friendship and a five-year relationship, Laura and David held their beautiful wedding at Sefton Park Palm House in Liverpool. After purchasing their first property just off the park, and with Dave originally from York and not being too familiar with Liverpool, it was a place where the couple had spent a lot of time together. 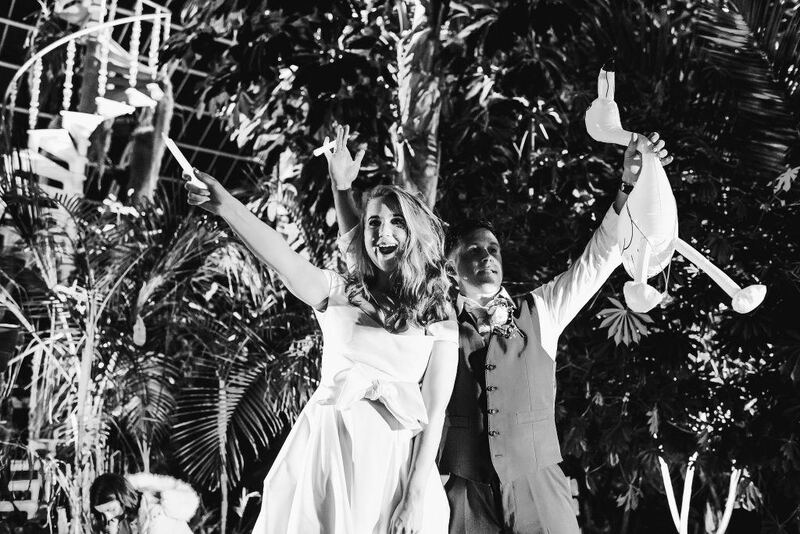 They decided it was the ideal venue to celebrate their love as the palm house is a breath-taking setting, as well as a local and a familiar place they could visit together after the big day to reminisce about all the fun. The couple got engaged in America the year before their wedding so an American twist was present throughout the big day. 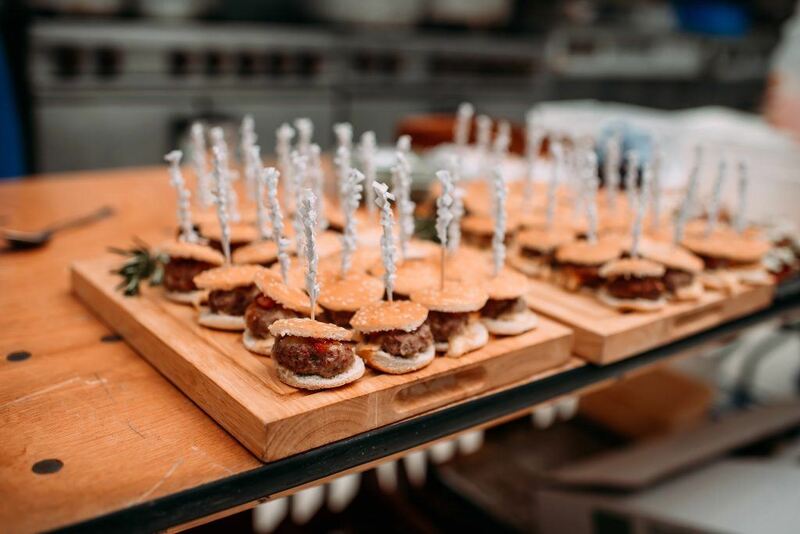 For example, there was a beer pong table and their guests were given popcorn to enjoy on the coach between the church and the venue, and of course their menu was created with this theme in mind. 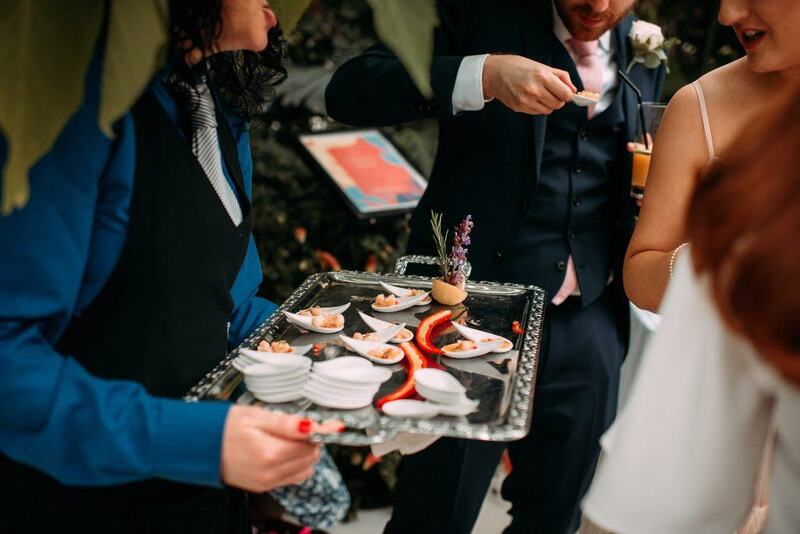 It was important to Laura and Dave that their wedding was fun and different for all of their guests, whilst simultaneously reflecting all the things they loved, and food was a huge part of this. They told us that they weren’t expecting to have so much choice on offer to them, but decided to use the Deep South of America as inspiration, having recently travelled the area and got engaged there. This meant that whilst they still had a ‘traditional’ three course meal, it was slightly more laid back to suit their personalities, with tasty, Southern style food. To start, they enjoyed a Crab and Asparagus Tart with Crabcake Fritter and Candied Lemon and chose Spatchcock Chicken for the main course with sides of Creamed Corn, Roast Ranch Potatoes, Collard Greens, Slaw and Mac n Cheese Balls. Dessert was a delicious Chocolate and Peanut Butter Brownie with Salted Caramel Ice Cream. The guests loved the side dishes that accompanied the main course as it was completely different to what many of them had had before – the Creamed Corn and Mac n Cheese Balls were particularly enjoyed. Laura and Dave told us afterwards that the dessert stole the show, and that so many of their guests told them it was the best dessert they had ever had which is, of course, wonderful to hear! Afterwards, we asked Laura what her favourite memory of the day was. She told us there were far too many to choose from, but some of her highlights include the ceremony itself at the church where she married her best friend, seeing all their family and friends and Dave surprising her during the evening do by getting on stage and playing trumpet with the band – and of course, their epic rave for the last hour which consisted of glow sticks, neon face paint and even some crowd-surfing!